Alleged Russian airstrikes struck the villages of Khan al-Sabil and Baksriya in the countryside of Jisr al-Shughour, according to local media. Around 3 am on January 20th, an alleged strike hit Baksriya and killed two civilians; one man and a woman. Between two and nine civilians were reported wounded and were evacuated by the Syrian Civil Defense teams. One local source alleged that most of the wounded were children, but did not mention a specific number. The incident occured at approximately 3:00 am local time. 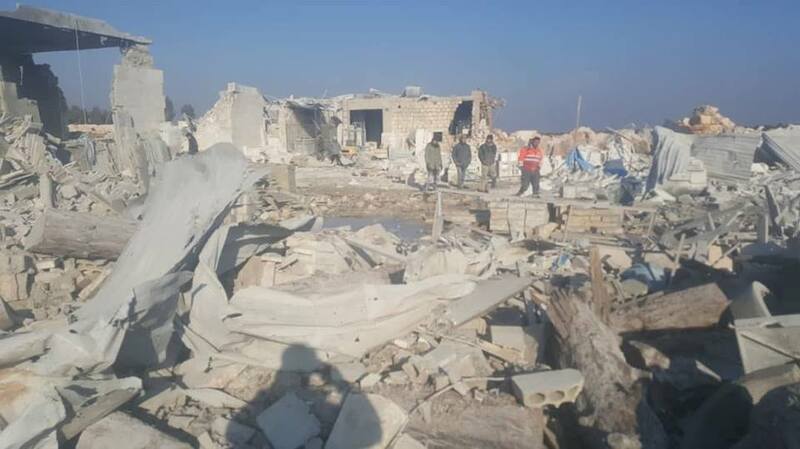 Destructed buildings of alleged Russian airstrike that targeted Baksriya (via LCCsy). Destructed building in Baksriya caused by an alleged Russian airstrike (via JMC). Destructed building in Baksriya caused by an alleged Russian (via Jisir TV). Firefighters in the Syrian Civil Defense extinguished a fire in Baksriya caused by an alleged Russian airstrike (via @SyriaCivilDefense). Destructed building in Baksriya caused by an alleged Russian airsrike(via @SyrianCoalition).